3B Scientific's range of anthropological skulls has been newly reissued in its entirety. The results are plain to see. All models are the finest castings produced from scientifically made copies of specimens featured in the collection at the Institute of Anthropology and Human Genetics for Biologists at the Johann-Wolfgang-Goethe University, Frankfurt/Main, Germany. This means that all the details can be reproduced absolutely accurately. This unique replica is supplemented by having it displayed on a pedestal that contains a relief map of the geographical area where the specimen was found. This model is a high-quality casting of a reconstruction of the Kalvarium skull (KMN-ER 406) with a partial mandible (Omo L. 7a-125). The Kalvarium skull is approximately 1.7 million years old and was discovered at Lake Rudolph (now called Lake Turkana) in 1970. The partial mandible comes from a different dig but is clearly from the same species. The classification of the species has not yet been indisputably clarified. 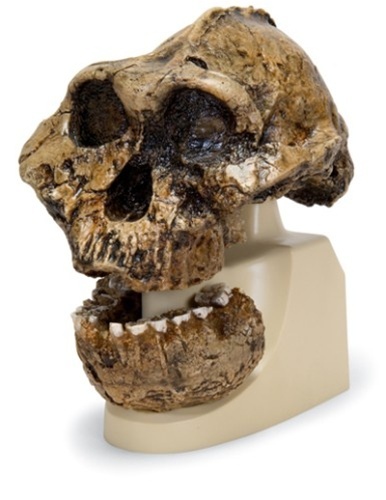 Discussions continue as to whether the specimen is an Australopithecus boisei or a Paranthropus boisei. Example of a pre-human hominid.